I'm going to keep harping on this until I see a good reason to desist. US policy toward Africa is becoming heavily militarized. If current trends continue, we'll soon be making cool graphics like these ones below--illustrating US attacks in Pakistan--about Somalia, Mali, Eritrea, and perhaps even northern Nigeria. Do not underestimate the sheer momentum of the US military, once the money starts flowing its way. The resources available to it dwarf by two full orders of magnitude anything available to State or USAID. Very soon the military could own US Africa policy, and people like this charmer will be deciding what Africa needs of us. 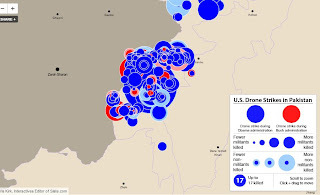 This graphic, created in October, 2012, depicts US drone strikes in Pakistan under Obama. 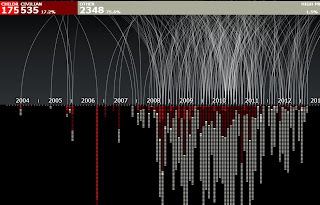 And this graphic, though it might have some questionable labeling, depicts US military strikes in Pakistan since 2004.